For 2017’s running of the Greco-Roman World Championships, 80 kilograms takes over as the hot spot. It’s the cool place to be. A big reason for that has to do with with a few of the names who have moved up into the non-Olympic weight class. Russia’s Roman Vlasov (world no. 1) waved goodbye to 75 kilos at the World Cup in March after owning this division (going back to when it was 74) for over eight years. One of his primary challengers over the course of his career, Mark Madsen (DEN, world no. 10), also decided that 75 wasn’t quite the same fit it used to be as he advances in age. Throw in the likes of Zurabi Datunashvili (GEO, world no 3) and Bozo Starcevic (CRO, world no. 13), and what you have here is a bracket that promises to offer plenty of scintillating match-ups that could wind up stealing the show on Tuesday, the second and last day of the event. Cheney Haight (NYAC) gets the call for the Americans and owns the distinction of being the oldest member on the team. Ignore that. 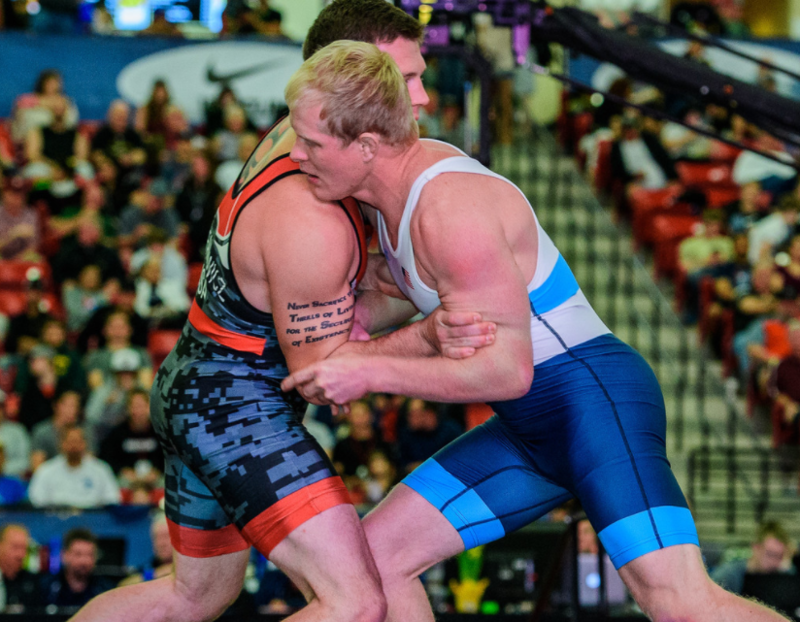 Haight put together a sparkling 2016-17 campaign that included a mesmerizing run to a US Senior National title along with a crushing performance in Brazil for his second consecutive Pan Ams gold. If Haight has lost a step, it is undetectable. The field here is deeper than ever before given the presence of the group mentioned above. So be it. Cheney Haight doesn’t have the flash the others do, but that’s what makes him who he is. He’s in Paris to put a punctuation mark on what has been a remarkably consistent and successful competitive career. Sentimentality doesn’t win medals, everyone knows that. But he doesn’t need it. Haight has more than enough working for him to be right there with the best on the planet and he’s got one more chance to definitively prove that fact. Let’s get it straight right off the bat — until further notice, Vlasov is the undisputed best wrestler at this weight class, or practically any other, for that matter. But that isn’t to suggest he’s unbeatable, especially currently. Vlasov didn’t exactly light it up at the World Cup in March, which was his last foray at 75 kilos. And in his 80 kilogram debut at the Russian Nationals a couple months ago, he looked decidedly much more “mortal” than he has in awhile, save for Rio, where he won two matches due to what could only be described as fortuitous circumstances. Vlasov struggled mightily with Adlan Akiev (world no. 8) in the national final. Akiev is excellent in his own right, but certainly not who is someone supposed to give Vlasov the problems he did. The move up in weight for the sport’s biggest star reportedly wasn’t supposed to happen until 2018, but here he is. What will help him the most in Paris is that there are other notable 75’s who moved up with him. Familiarity matters. After Madsen fell to Vlasov in the Olympic finals last year to pick up his fifth World-level silver, there was a whole lot of talk that he would be stepping away. That was the water cooler consensus. But as the seasons changed and the leaves went from green to amber and back to green, Madsen ratcheted up his training. He returned in full at the Nordic Championships in June, taking silver to Alex Kessidis (listed below), but you kind of dismiss that for now, despite his unreal prior history at that tournament. Madsen was on another collision course with Kessidis at the Pytlasinski Cup in July, but wound up bowing out of their semifinal match-up and the event altogether for a fifth-place finish. Was it an injury? Who knows? Madsen is surely aware that time isn’t on his side. He is back for yet another shot at gold and with how haywire things are at this weight, his chances here are as good as they ever were before. Datunashvili, one of Greco’s more elegant combatants, has also been quite the escape artist in 2017. It started in late March at the Hungarian Grand Prix. US fans will remember this. After 2014 World Champion Peter Bacsi (HUN, world no. 12) edged the Georgian in the semis, he went on to face John Stefanowicz (Marines) in the bronze medal bout. Down by two, Stefanowicz appeared to four Datunashvili off the edge as time ran out. Of course, Stefanowicz didn’t get the four-point call and lost on criteria. In May, Datunashvili somehow squeaked past Daniel Aleksandrov (listed below) in the round of 16 before he was virtually gifted a victory over Akiev in the semis. However, he did wrestle a great match against Radzik Kuliyeu (BLR) to emerge with his second Euro gold in a row. The point is, if there is one, Datunashvili figures out ways to win. He’s a technical marvel, too, so that helps. Few switch directions the way he can and Datunashvili snatches limbs at light speed. Cagey cat. Kessidis was an undercover contender for a medal at the 2016 Worlds in Budapest and deserved to be. Strong performances throughout the last few years dictated as such, but it’s what you’ve seen that matters more. He four’ed Yousef Ghaderian (IRI) in the first round of the ’16 Worlds a couple of times to nab a statement-making tech, but fell into quicksand against Azerbaijani stud Rafik Huysenov (world no. 7) and didn’t advance further. This year, his win over Gela Bolkvadze (GEO) at the U23 Euros was a textbook case of a wrestler who knows how to stay within himself. Bolkvadze is a more-than-solid worker but when the heat was on, it was Kessidis who took charge. A month later, the Swede eeked one out against Madsen at the Nordic Championships. Next was the Pytlasinski Cup, where Kessidis ran over 2015 Junior World silver medalist Buhan Akbudak (TUR) in the finals. He’s currently riding a three-event winning streak after placing third at both Thor Masters and the Paris Grand Prix — solid. Is it enough momentum to make noise next week? That’s iffy. But Kessidis won’t be daunted no matter the draw and could wind up being a surprising threat to the throne. It’s not that Atem isn’t terrific, because he is. But what stands out the most about this wrestler is his toughness. No one is doing too much to this guy he doesn’t want to happen. Any offensive points Atem seems to give up take way more out of his opposition than they do him. He’s like a body puncher who willingly takes shots to the head in order to keep his attack going. Atem veers more towards the brutal side of Greco, even though he has unfurled some very pretty throws on occasion. But it hasn’t all been sunshine and roses lately. Ramazan Abacharev (RUS, world no. 2) out-grinded him in the World finals and since then, it’s like he hasn’t been the same. Atem went 1-3 at March’s World Cup, losing to Ghaderian, Kuliyeu, and Dmytro Pyshkov (UKR). Next was a fifth at the Vehbi Emre & Hamit Kaplan Tournament, a home event for him. He rebounded at the Euros, coming in third, another loss to Kuliyeu responsible for his derailing. So yeah, Atem is a bit of a question mark right now, even though there’s enough out there on him to believe he’ll be a problem on Tuesday. Which Ghaderian is going to show up? Will it be the one that throws caution to the wind and fearlessly attacks inside, putting opponents on their heels and hungrily looking to end matches? Or will it be the Ghaderian who is content to let others lull him to sleep before they walk him into traps he can’t get out of? If it’s the former, then Iran is going to be very happy. When Ghaderian is at his best, it’s because he is staying upright, engaged, and ready to push forward. It’s not about picking up points for him so much as it is posture. Opponents who have found success against Ghaderian lately have done so by forcing him out of his stance where they’ve been able to pressure him into getting called for passives. Obviously, that is not ideal for him since there won’t be a par terre chance that’ll appear from out of nowhere to bail him out. Ghaderian has raised his game since Budapest and a patient-yet-heavy-pressurized approach against World champ Abacharev at the World Cup showed he was getting the hang of the rule-set. Aleksandrov is an athlete who enjoys getting into a rhythm. He seems to wrestle with a beat in his head at times, almost like an American folkstyler. When he has a little space and isn’t mucked up in a stalemating pummel, his feet set the tempo. Aleksandrov usually claws in with underhooks, a position he can be dominant with. He’s long and strong, and opponents typically have a lot of trouble working with their own overhook as a defensive measure because Aleksandrov is moving them around so much from there. But he is equally adept with an overhook and likes to set up his arm throws by weaving across and corkscrewing down to his hip if he has the hook tight enough. A loss to Datunashvili was followed up with a frustrating defeat to Akiev in the bronze medal match at the Euros. Last time out, Aleksandrov beat up on Germany’s Michael Wagner at the Ion Corneanu & Ladislau Simon Memorial. All in all, he’s not going to get a terrific draw, but that doesn’t mean he should be forgotten about. Cheney Haight is not only the oldest/longest-tenured wrestler on the American squad, he is also its quiet anchor. Haight, 32, is a lead-by-example type who is less interested in talking about himself than he is making sure he goes to practice every day. That’s his thing. Haight believes if he’s always training, he will always be mentally ready for competition. But that is a lesson he had to learn for himself. Following an age-group career that included a Fargo National title, Haight went onto Northern Michigan University where he was coached by Ivan Ivanov, the man responsible for turning that program from a developmental experiment into the premier breeding ground for the country’s best young talent. NMU during Haight’s days offered up a murderer’s row of wrestlers who either became stars while they were still students or later on in their respective careers. Spenser Mango, Joe Betterman, Andy Wheeler, Jake Fisher, Harry Lester, Andy Bisek…the list goes on and on. Haight was one of them. Under Ivanov’s care and instruction, Haight morphed into one of the better 74 kilogram competitors in the US and by 2008, was an Olympic Trials finalist, losing out to the legendary TC Dantzler in two straight matches. At only 23, he had come awfully close to reaching the mountaintop. In 2010, Haight earned his first Senior National championship, his career now virtually on cruise control. The next year, he finally kicked the door open and made his first World Team. An 0-1 performance at the Istanbul World Championships wasn’t what he was hoping for, but nevertheless, Haight was in a good position. As the top guy at his weight heading into the Olympic Year, it was reasonable to expect that he would be a legitimate favorite to find his way on the London Olympic Team. Only, that didn’t happen. A surprising loss early on in the Trials’ challenge tournament ended his bid and sent him reeling. He had hit the wall. Haight left the sport following the Trials in Iowa City and required some time to reevaluate. He got married, life changed a little. He coached some, worked some. But things weren’t the same. There was a piece of him missing. His wife, Amy, pointed out that there was still time, that he could come back and resume his career as if he’d never really left. Maybe it took a little prodding, a few more conversations with trusted voices. But eventually, it all resulted in a Haight return. It wasn’t a full-on plunge back into matches. 2014 saw Haight touch down at the Bill Farrell Memorial in November, where he took third. Then it was the Zagreb Open in Croatia three months later. He was getting his sea legs underneath him. A runner-up finish to Geordan Speiller (Florida Jets) at the 2015 US Nationals/Olympic Trials Qualifier capped the year. Haight had been competing at 75 kilograms, the Olympic weight, throughout most of the year in preparation for the Trials. 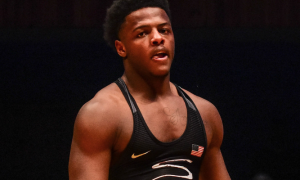 A quick jaunt up to 80 kilos at the Pan Ams in February of 2016 resulted in his first title at that event, but it was back down to 75 in Iowa City with an Olympic Team spot on the line. He advanced to the finals of the challenge tournament, once again falling to Speiller. There would be no more matches at 75. That ship had sailed. 80 fit Haight better and he knew it. So did everybody else. A late passivity call in the semifinals of the non-Olympic Weight World Team Trials against Jon Anderson (Army/WCAP) cut short his try at that team, but he was undaunted. It was weird, anyway. A Trials tournament in November? The timing didn’t seem right. Haight rebounded with a strong performance at the World Clubs Cup in Budapest, but what came next was even stronger. Just two weeks later in Las Vegas, Haight ran over the field at the US Open and in the process, collected his second Senior National title six and a half years after his first. The win carried significance outside of that. For a wrestler on the other side of 30, talk about retirement or “slowing down” has a habit of seeping in. It’s natural. 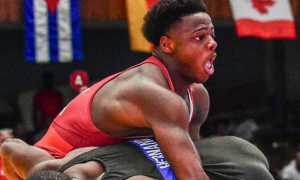 Wrestling, Greco in particular, is often labeled a “young man’s sport.” Well, the second oldest athlete at the tournament had outscored all three of his opponents on the day 24-4, going unscored upon in his last two bouts. A trip overseas in March of 2017 didn’t yield any medals for Haight, but it did harden him up for the pressure-cooker on the horizon. Haight entered into the World Team Trials in late April as the top seed, but he was not the favorite — that distinction belonged to Speiller, who had come back from a brief hiatus to capture two international golds and a silver. Stefanowicz had also made some noise across the Atlantic, nearly defeating Datunashvili in the Hungarian Grand Prix bronze medal match. Other studs, such as Courtney Myers (Army/WCAP) and Barrett Stanghill (Minnesota Storm) were also in the argument. It didn’t matter. Haight tech’ed out Air Force’s Brandon Johnson before squeaking past Myers in a tense semifinal bout. Stefanowicz, for his part, was hot as fire. He had upset Speiller in the semis with a clutch two-point arm throw late in their bout and was working with a high level of confidence. Haight swept both matches against Stefanowicz, though each one was as tight and competitive as could be. It was another World Team spot and just like that Open title from December, this one came six years after the first one. It was also another testament to Haight’s resilience and he had earned this one his way. There wasn’t a ton of talk, there wasn’t a litany of hyperbolic declarations or chest-pounding, finger-pointing cries about being underestimated. As had been the case throughout his career, Haight simply prepared as diligently as possible and went to work with the quiet confidence that his best could be good enough. And it was. Again. A week after the Trials, Haight bulldozed the field at the 2017 Pan Am Championships for his second consecutive gold at that event. A month after that, in early June, came the Tbilisi Grand Prix and a frustrating loss to Varlam Kvaratshkehli (GEO) due to some questionable officiating. This wasn’t vital — the Americans viewed Tbilisi as a practice tournament and part of the overall training phase for Paris. In fact, the primary disappointment lied only in the fact that Haight didn’t get more mat time in. Haight’s attributes as a competitor are many. He brings purposeful pressure. He’ll go for his arm drags, pummel into underhooks, nestle two-on-one’s, and get to the body. Of course. By now, Haight’s game has all of the fundamental boxes checked. But it is the motor powering the engine that matters. The guy is relentless without being reckless. And if he pushes forward enough, it allows him to set up his beautiful arm throw, which still remains one of the best in the entire country. Haight’s arm throw is a serious weapon not just because of its effectiveness, but also because of its efficiency. He doesn’t go for it so much that it’s easy to anticipate and since he can snag one from a variety of angles, it’s difficult for opponents to either see coming or prepare for. The result is an attempt-to-conversion percentage that most would be envious of. Another item running in his favor is conditioning. He’s always in phenomenal shape, which is a necessity for the style he employs. You don’t have to worry about Haight lagging in the second period or looking for ways to waste time so he can catch his breath. No, he wants persistent action and is looking for contact every blessed second he’s on a mat. Because of this, his tie-ups very rarely wind up in a prolonged stalemate and with the current set of rules, that’s a decent feather to keep in his cap. Similar to Patrick Smith (71 kg, Minnesota Storm), fans love Haight because they relate to him. He’s one of them. He is an unassuming athlete who is much more about substance than style and goes about his work with a dignified intensity. It’s a passion play for him. Haight is a classic battler who offers up the same level of ferocity no matter where he is and people admire that about him. They always have. The reason why Haight is a potential medalist in Paris is simple — he operates on this level. There is not a wrestler here who is going to outwork him and so long as he doesn’t second-guess himself or hesitate, will contest each exchange and position with the kind of fire that has been his calling card. To advance, offensive points are going to be a big thing, specifically in this weight class. Haight is going to have to take some risks. As dominating as he can be inside, there will be times when owning tie-ups won’t be good enough. It doesn’t matter if it’s an arm throw attempt, a shot at a high dive, or a bodylock he can hardly wrap around on, Haight, like most Americans, will need to show he’s busy so as to avoid the passivity fairy. Medal or no medal, the 2017 World Championships likely represents the final chapter in Haight’s incredible career. Assume he wants to go out guns blazing. That’s actually a fairly effective strategy for Haight to adhere to at this tournament and not in a trite “fortune favors the bold” kind of way. If we’ve learned anything since the fall, it is that wrestlers who sustain hectic work rates and make plenty of attempts often occupy the driver’s seat. So there you go, that’s Haight in a nutshell. He’ll be the sentimental pick for plenty of US fans, and that’s fine. But Haight is podium-worthy even without all that. His recent performances have revealed a wrestler who is still functioning at an extremely high level and when you factor in the beating heart behind it all, it’s difficult not to picture him managing to put forth a memorable effort one way or the other. Szabo is here as Hungary’s representative because he knows how to perform. He would have been a World finalist if he didn’t give up a late takedown (off a scramble, no less) to Atem in the semifinals, but what can you do? Szabo has the lungs, experience, and confidence necessary to perform well here and if he can survive the early rounds, will likely contend. This guy is not as technical as he is tough. Starcevic is the kind of wrestler few look forward to meeting up with because they know it’s going to be a grinding battle. He’s most famous at this point for choking out Vlasov in the Rio semis and he’s probably okay with that. It’s not about Starcevic finding the podium as much it’s about whose day he is going to spoil.